Biodiversity Net Gain is when development leaves biodiversity in a better state than before. Business needs new ways to protect nature while also delivering economic growth, new infrastructure and resilience for the future. Adopting a principle of Biodiversity Net Gain is a key opportunity. Net gain focuses on avoiding the impact first of all, then following through a hierarchy of minimising, restoring and, as a last option, creating new habitat elsewhere. 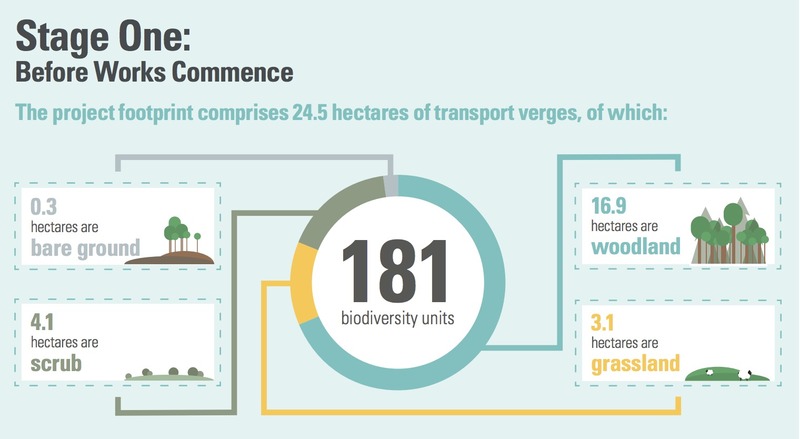 Experts of Balfour Beauty, eftec (economics for the environment) and Forest Trends have prepared an infographic explaining the natural capital benefits of delivering Biodiversity Net Gain (BNG) in corporate strategies. Put at its most simple, Biodiversity Net Gain is when development leaves biodiversity in a better state than before. Business needs new ways to protect nature while also delivering economic growth, new infrastructure and resilience for the future. Adopting a principle of BNG is a key opportunity. Net gain focuses on avoiding the impact first of all, then following through a hierarchy of minimising, restoring and, as a last option, creating new habitat elsewhere. Countries such as Germany, United States and Australia have followed net gain principles for up to 40 years. In the UK, the concept has already been adopted by major infrastructure companies with the UK government having done much of the groundwork. While Biodiversity Net Gain can be measured in ‘biodiversity units’ using Department for Environment Food and Rural Affairs’s metric, there is no standardised way to value the wider societal and economic benefits. Putting a financial value on elements of Natural Capital can reveal a range of wider benefits that arise from BNG. This can support better decision making on what, where and how development should proceed to be genuinely sustainable. The following infographic is the industry-first project developed by Balfour Beauty, eftec y Forest Trends to value the community benefits (using the Natural Capital approach) generated by achieving Biodiversity Net Gain on a project to upgrade transport infrastructure. Note: only air quality, climate regulation and recreation have been calculated for this project, but there are many other community benefits from Biodiversity Net Gain, such us water regulation, natural assests loss avoidance or encouragement of ecosystem functions. Source: Balfour Beauty, Forest Trends.